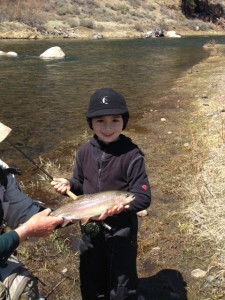 I fished the Little Truckee Sunday with a couple from San Francisco and their 6 year old son. This was their first fly fishing experience. It was a beautiful sunny day and there were quite a few people out. Almost everyone I talked to had caught some fish. A small caddis was hatching when we got there. Fish were eating the pupa just under the surface in the flat water stretches. Saw a few BWOs and little dark stoneflies, but not very many. While there was the occasional rising fish, nymphing was the best tactic. A small BWO nymph and a small San Juan worm worked best for us. The flows are about 160cfs and there are plenty of fish in the stream. I saw fish in every run we fished. The 6 year old, Sean, caught the first and biggest fish all by himself. Great kid and very focused on fishing! Definitely a fun day on the LT.